Luton, United Kingdom – January 18, 2019 – Anritsu Corporation, a global provider of innovative test and measurement solutions for advanced and converged networks, will be showing advanced solutions supporting the latest 5G standards and network deployments at Mobile World Congress (MWC) 2019 at Barcelona (Hall 6 Stand F40). 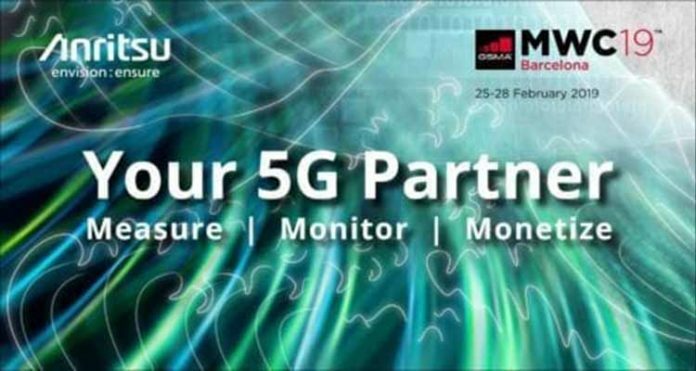 During the conference, Anritsu will focus on the key test and monitoring solutions for 5G device testing, Conformance Testing, eSIM, Field Installation and Testing, C-RAN deployment, Advanced Analytics and Telco Cloud Support. Anritsu is at the leading edge of 5G development and deployment, providing testing and monitoring solutions across the telecoms eco-system and a diverse range of industry verticals related to 5G. Anritsu test and measurement solutions cover the full range of devices, base-station and access networks, data centres and core networks, and across the full life cycle of R&D, certification, production, and installation/maintenance. The monitoring solutions for mobile networks give enhanced visibility across domains, with advanced analytics and insights into network performance. MT1000A Network Master Pro – a portable easy to use test solution with 10G, 25G and 100G interfaces which accurately measures and analyzes critical network performance parameters. These include one-way latency, which allows 5G operators to ensure URLLC performance and be confident in the end-to-end quality of service. eSim solutions – Anritsu OTA evaluation solution for embedded SIM (eSIM) provisioning based on the signalling tester MD8475A/B and the COMPRION eUICC profile manager. SmartStudio NR – the industry-first state machine base GUI to simulate 5G-NR mobile network, for fast and effective 5G device testing and verification. MT8000A – latest 5G network simulator for 5G device/chipset R&D testing of protocol and RF measurement, MT8000A supports both protocol tests and RF measurement testing in one box. 5G Conformance Test – the evolution of the ME7873NR and ME7834NR Anritsu conformance test systems. The ME7873NR will support RF (TRX and Performance) measurement, and radio resource management (RRM) conformance testing of 5G NR non-standalone and standalone devices as per 3GPP 38.521-1 and 38.521-3. The ME7834NR systems will support protocol conformance testing of 5G NR non-standalone and standalone devices for both sub-6 GHz and mmWave as per 3GPP 38.523-1. Anritsu’s ground breaking MasterClaw portfolio (including eoSight, eoMind, eoSense, eoLive, and eoSearch solutions) delivers advanced analytics and artificial intelligence driven insights which not only help make complex decisions regarding network life cycle management but also allow automation of problem-solving processes via Anritsu’s innovative Next Best Action solution. Network Slicing offers significant business potentials for CSPs which will allow them to sell “slices” of the network customized for specific end applications. Anritsu is well positioned to serve these 5G verticals giving CSPs the opportunity of reselling Advanced Analytics to their Enterprise customers, thus enabling them not only to implement business critical SLAs but also to check the compliance status of those agreed upon SLAs. In addition to that, Anritsu’s NFV Closed Loop Automation solution is primed to provide CSPs with continuous and seamless visibility on operations while enabling virtualized infrastructures to adjust automatically to dynamic network conditions reducing costs significantly and helping to reach true excellence in service delivery. For more information, visit Anritsu in Hall 6 Stand F40.